Hungarian lawyer and journalist; born at Asszonyfa (County Raab), May 8, 1841; died at Budapest April 30, 1902. After studying medicine for three years at Vienna, he took up law, and received his degree at Budapest in 1866. 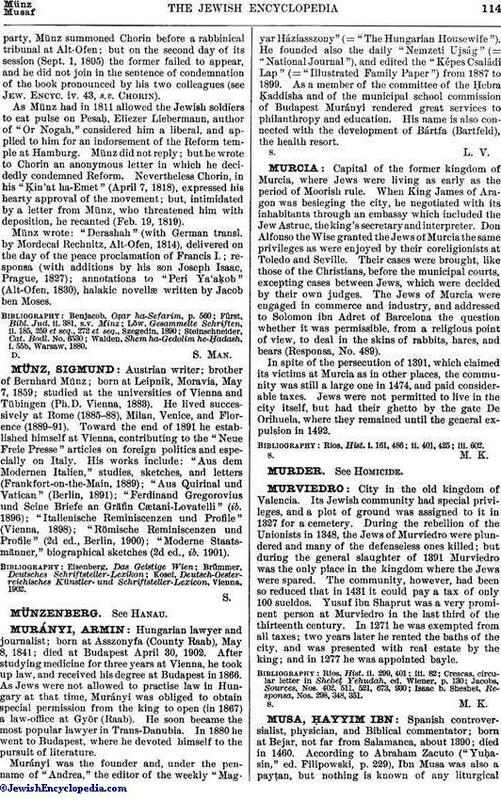 As Jews were not allowed to practise law in Hungary at that time, Murányi was obliged to obtain special permission from the king to open (in 1867) a law-office at Györ (Raab). He soon became the most popular lawyer in Trans-Danubia. In 1880 he went to Budapest, where he devoted himself to the pursuit of literature. Murányi was the founder and, under the pen-name of "Andrea," the editor of the weekly "Magyar Háziasszony" (= "The Hungarian Housewife"). He founded also the daily "Nemzeti Ujság" (= "National Journal"), and edited the "Kápes Családi Lap" (= "Illustrated Family Paper") from 1887 to 1899. As a member of the committee of the Ḥebra Ḳaddisha and of the municipal school commission of Budapest Murányi rendered great services to philanthropy and education. His name is also connected with the development of Bártfa (Bartfeld), the health resort.